We are thrilled to be able to offer our professional pet sitting and dog walking services to the Savannah, Georgia area. Savannah is a gorgeous place to live and is full of pet owners just like you. At Trusty Tails Pet Care we pride ourselves in providing top-notch service to the pets and owners we serve. Whether you need a hand when it comes to getting your dog’s daily exercise or if you need someone to stay with your pet while you’re away on vacation, we’ve got you covered in Savannah. If you travel frequently for work, are going to take a trip, or are going on a nice vacation away, you’re going to need a pet sitter to care for your pets while you aren’t home. Our Trusty Tails dog walkers and pet sitters in Savannah, GA are ready and willing to help you out in these situations. You no longer need to nag that neighbor, family member or friend to care for your pet. Trusty Tails professional pet sitters and dog walkers are ready for hire. We are available 7 days a week, 365 days a year to come to your home and visit your cat or your dog when you aren’t able to come home for them. Please check out our Cat Sitting Services, Pet Sitting Services and Overnight Pet Care services to see how we can help you. We know you love your dog, but we also know that you can’t always be there for him. Don’t feel guilty that you can’t make it home because you are stuck at work or can’t make it home to let your dog out during your lunch break. Trusty Tails can help you out. Our Savannah dog walkers are here to provide your pet the care and love they deserve when you cannot be there. Whether your dog needs a bathroom break, some exercise or a nice walk, fresh air, a meal or some medicine, we have you covered. Learn more about our Dog Walking Services and how we can help today. One of the first things most people ask when looking at our services is in regards to pricing. Dog walking and pet sitting rates can have a vast range depending on the company and location. There are so many factors that can affect the Savannah dog walking and pet sitting prices so in order to keep it simple, we’ve created our pricing page that should help to answer any of your questions. Owning a dog in the beautiful Savannah, Georgia area is such a great experience. With areas ranging from the quiet pristine beaches to the lively historic downtown, you and your pet are sure to enjoy many of the perks Savannah has to offer. 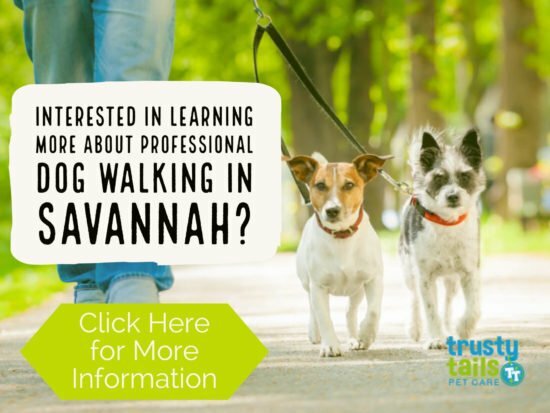 At Trusty Tails, we love to help, so we have created a resource guide listing out the Must-Know Pet Places In Savannah to help you find everything you need from pet stores, vets, dog parks and more all in one spot. Do you and your dog like to shop? Does your cat need a new bed or toy? You can’t always shop on Amazon for everything. Sometimes it’s nice to get out and support those local businesses. Here is a list of the local Savannah pet stores in the area where you can shop for all your pet’s needs. Bentley’s Pet Stuff is located in Savannah at Habersham Village. They also have 3 other locations throughout the surrounding areas of Savannah at Pooler Marketplace, Whitemarsh Island (Next to Publix) and the newest location in Berwick Marketplace. Formerly known as Tail Spin Pets, they still have the same knowledgeable staff, their food promise is the same (no corn, wheat or soy), and their love for the community and giving back is still important. At Bentley’s they live by the golden rule of treating others how you wish to be treated and as pet parents, that rule naturally extends to their four-legged friends. Bentley’s believes that one of the most important ways to show them how much you care is by feeding them all natural, nutrient-rich foods. This is why they partner with pet parents to help them find the very best for their furry family members. The PetSmart in Savannah is located at 1821 E. Victory Dr. Bldg B, Savannah, GA. PetSmart, Inc. is the largest specialty pet retailer of services and solutions for the lifetime needs of pets. At PetSmart, they love pets, and they believe pets make us better people. Every day with every connection, PetSmart’s passionate associates help bring pet parents closer to their pets so they can live more fulfilled lives. This vision impacts everything they do for their customers, the way they support their associates, and how they give back to their communities. Pet Supermarket is located in Savannah at Chatham Plaza. Pet Supermarket has everything you need for your furry friends! They specialize in pet food, toys, treats, accessories, fashion and more! In the Savannah store they offer the VIP Petcare clinic (every Saturday from 4:00pm-5:30pm) and full grooming services. In addition, Pet Supermarket works with local organizations to host adoption and related events for animal welfare. Canine Palace in Savannah is located at 2805 Bull St, Savannah, GA. You can find everything your dog or cat needs at Canine Palace in Savannah. They have a wide selection of items including the highest quality commercial pet foods, enticing treats (including locally made goodies), designer dog beds, an awesome array of toys, collars and leads and every stylish accessory your dog is drooling for. They also have great supplies for your cats too…Kitty Kaviar, anyone? Does your dog need a treat or a yummy snack? Have a pet birthday to celebrate or need to buy a friend’s pet a gift? Here are few Savannah dog bakeries that your dog is going to love. The treats in these shops are so delicious looking, you are bound to want something for yourself. Oliver Bentleys in Savannah is located at 127 Abercorn St #305, Savannah, GA. Oliver Bentleys, Ltd. hand-bakes, in small batches, all human grade ingredient, premium dog treats called Ollie B. Biscuits™. They believe that because our dogs give us their best every day we should want nothing but the best for them in return. With this in mind, and thoughtfully taking into account what is best for the canine digestive system and diet, they make their Ollie B. Biscuits™ 100% gluten free with no wheat, corn, or soy. They have no added salt or sugar and never, ever, any additives, preservatives or fillers. Ollie B. Biscuits are high in protein and have almost half the crude fat of most other treats. The original recipe is completely meat and meat by-product free. Woof Gang Bakery has 5 different locations throughout Savannah including River Street, Bull Street, City Market, Saint Julian and the Starland District location which also offers full service grooming. Woof Gang Bakery is the leading specialty retailer of pet food, pet supplies and professional pet grooming in North America, with more than 100 locations across the U.S., Woof Gang Bakery offers the very best in pet care by providing quality products and grooming with a service-oriented approach. Each location is a neighborhood store committed to the well-being, health and happiness of pets. Do you want to get a dog or cat? Perhaps you would like to volunteer or even donate some money. If so, these rescue groups want to know who you are. There are so many pets in shelters that would love to find their forever home and need your help. One Love Animal Rescue in Savannah does not have a public facility, but rather they work from a foster network within the Savannah community. Each of the animals listed in their animal gallery are located in various foster homes within the community and they would be happy to schedule a meet and greet with them. The mission of One Love Animal Rescue is to help abandoned, neglected, abused and unwanted pets by partnering with shelters, rescue groups and the community to facilitate adoption of these animals into permanent and loving homes. Their dream is that one day all the shelters will be empty because every pet will have a home. The Humane Society for Greater Savannah is located at 215 Sallie Mood Dr, Savannah, GA. The Humane Society for Greater Savannah envisions a community that understands, values and promotes the ways in which pets enrich our lives. They offer many pet adoption, pet fostering and volunteer opportunities as well as spay and neuter services, medical services, training classes and much more. Whether you’re looking for a new furry friend or want to give back to help other animals in your community, the Humane Society for Greater Savannah is a great organization to work with. Save-A-Life in Savannah can be found at the PetSmart on Abercorn in Savannah on Saturdays from 11:00AM – 2:30PM. They offer adoption and volunteer opportunities as well as discounted spay/neuter certificates. They work hard to help reduce the overpopulation, that causes many pets to end up in shelters or on the streets, by offering financial assistance for spay/neuter services. With their adoption program they include all spaying/neutering fees in the donation for adoption in order to ensure they will not reproduce later on and continue to add to the overpopulation problem. Save-A-Life is doing a wonderful job in the Savannah community so if you’d like to adopt a pet or would like to volunteer your time, contact them today. Don’t know where to take your pet for veterinary care? There are over dozen Vets in Savannah ready to care for your dog or cat. Whether your pet needs his yearly health checkup and vaccines, or she needs care for an injury or illness, there is a vet in Savannah that can help. Case Veterinary Hospital is located at 111 Eisenhower Dr in Savannah, GA. Case has been taking care of Savannah’s pets for over 100 years. They are a full service, family owned hospital providing wellness services, advanced dental services, surgery, ultrasound, laparoscopy, boarding, grooming, and pet supplies. Central Animal Hospital is located in Savannah at 2417 Bull St, and it is their philosophy to care for all pets as if they were their own. To them, that means they are going to give them the same love, attention, and care as though they were their owner. They are a team of animal lovers there to give their patients (your pet) the attention and care they deserve. Crossroad Animal Hospital is located at 1201 E Montgomery Cross Rd in Savannah, GA. The Crossroads team is committed to educating their clients in how to keep their pet’s healthy year round, through preventative medicine, with good nutrition and exercise. They stays on top of the latest advances in veterinary technology and above all, remembers that all animals and pets need to be treated with loving care in every check-up, procedure, or surgery. Eastside Veterinary Hospital is located in Savannah at 800 Ash St, and their focus is on communication with their clients because they believe solutions can be found in conversation with pet parents. The staff at Eastside are animal lovers themselves, and their reputation is their most valued asset and integrity their most prized possession. Eastside offers excellent service at an affordable price. Forsyth Park Animal Hospital is located at 513 Whitaker St in Savannah and is a full service veterinary hospital staffed with caring professionals who are looking forward to meeting all your pet’s healthcare needs. They offer vaccinations, general health care for newborn to geriatric pets, dentistry, general surgery, emergency care, nutritional education and more! Their mission is to provide excellent quality, compassionate care, and life-long health for your pet. Innovative Veterinary Medicine is located in Savannah at 7203 Skidaway Rd and is run by Dr. John Schuettle. It was started in 2006 and set out to rediscover what made the veterinary profession so great by providing veterinary care in-home. Even with their new location today, they still strive to provide the same experience for all of their patients. Georgetown Veterinary Hospital is located at 21 Brasseler Blvd in Savannah and has provided Savannah-area pets with a full-range of veterinarian services since 2005. They offer everything from state-of-the-art medical care to luxury boarding suites and animal grooming. Their goal is to make pets feel at home, while providing the highest quality service. Island Veterinary Clinic is located in Savannah at 416 Johnny Mercer Blvd, and they pride themselves on being a small neighborhood clinic, where their relationships with clients and patients can be more personal and therefore more beneficial. At Island Veterinary Clinic, their team takes pride in delivering personalized, compassionate care to their clients and patients. Savannah Animal Care is located at 510 W Bryan St in Savannah, and they’re on a mission to become the unparalleled choice for your animal’s care. From veterinary treatments to boarding and grooming, they provide the full spectrum of helpful services that your animal needs. Savannah Veterinary Internal Medicine & Intensive Care is located in Savannah at 335 Stephenson Ave and they are an experienced, compassionate and optimistic veterinary health care team who specialize in diagnosing and treating dogs and cats with chronic, debilitating, and often life-threatening diseases. VCA Greater Savannah Animal Hospital is located at 1350 DeRenne Ave in Savannah, and at VCA Greater Savannah Animal Hospital, you’ll be served by experienced, knowledgeable staff. Their veterinarians, technicians, and other pet-loving personnel are trained to the highest standards. Their knowledge of the latest veterinary medicines and procedures ensures that all of our patients get the best in prevention and healing methods. Savannah Veterinary Medical Center is located at 2014 E Victory Dr in Savannah, and they provide expert comprehensive medical care for your pets. Southside Hospital for Animals is located in Savannah at 10515 Abercorn St.
Are you thinking you might make a visit to Savannah, GA with your dog or cat? Have family and friends with a pet and need a pet friendly hotel in the area? Here are some great pet friendly hotels located in Savannah. The Kimpton Brice hotel is located in Savannah at 601 E Bay St, Savannah, GA. Enjoy the boutique hotel’s urban resort vibe right in the center of Savannah’s National Historic Landmark District and just a cobblestone’s throw away from the famed River Street and walking distance to City Market. At Kimpton, they love their pets! Can you blame them? They know that nights away from home are a lot more fun when you have your own furry friend by your side. That’s why at every Kimpton hotel, they invite you to bring your hairy, feathery or scaly family member with you for your stay — no matter their size, weight, or breed, all at no extra charge. If your pet fits through the door, they will welcome them in. The Kimpton Brice hotel shows your pet the love in even more ways with special offers and Directors of Pet Relations in some properties that greet you at the door. You can’t go wrong with a pet-friendly stay at The Kimpton Brice Hotel in Savannah. The Galloway House located at 107 E 35th St, Savannah, GA is Savannah’s last Plantation House & first A&B (apartment and breakfast). This historic spot offers 1 & 2 bedroom apartments with breakfast always included. The owners live on-site and have 3 large Great Danes of their own so, they say “Bring the Pooch! – Tiny to giant, dogs are always welcomed”. They are located about 1.5 miles from the historic district of Savannah so it’s very accessible to all the local attractions. The Staybridge Suites in the Historic District of Savannah is located at 301 E Bay St, Savannah GA. Flanked by the scenic Savannah River and the verdant, storied squares of downtown, this hotel is a traveler’s dream. The hotel’s historic district locale allows for endless adventures. You can embark on a historic trolley tour or browse the River Street boutiques, just steps from the hotel’s downtown Savannah address. It’s easy to bring your pet along when you stay with Staybridge Suites in the Savannah Historic District. Just book online, then call the front desk to give them your reservation confirmation number and ask them to add your pet to the reservation. There are some fees that apply, but they are worth it to be able to bring along your furry friend next time you visit Savannah. The Westin Savannah Harbor Golf Resort & Spa is located at 1 Resort Dr, Savannah, GA. Nestled along the banks of the Savannah River and situated just a ninety second ferry ride away from historic downtown, The Westin Savannah Harbor Golf Resort & Spa offers travelers an elevated escape in Georgia’s oldest city. Play a round on their PGA Championship golf course or relax with a treatment in their signature Heavenly Spa. Visitors can also take advantage of their complimentary hotel shuttle to enjoy Savannah’s historical attractions, dynamic restaurants and exciting nightlife. Dogs are allowed for an extra charge. Barkie Bow Wow is located in the Chippewa Shopping Plaza in Savannah. The owner of Barkie Bow Wow has a goal to care for each pet as if it were her own and provide world-class service. They offer a clean, safe, open grooming facility where you can be assured that your pet is getting the best care possible. They provide wonderful pet pampering for your dog or cat. All full-service grooming includes a bath, ear cleaning and nail trimming. Animal Resort & Spa in Savannah is located at 2357 Ogeechee Rd. They offer grooming services for dogs as well as boarding services for dogs, cats and exotics. Appointments are necessary for grooming so be sure to call ahead. The Savannah Groom Room is located at 2615 Skidaway Rd, Savannah, GA and it’s the place where all your pets get the individual attention they deserve. In order to focus on each pet individually they do grooming by appointment only so be sure to call ahead. Top Dog Spa is located at 50 Berwick Blvd, Savannah, GA. Your pet deserves to be pampered – and Top Dog Grooming Spa is a great destination! They offer a variety of grooming services that they can tailor to your pets individual needs. Herty Pines Dog Park is located off Bee Rd in Savannah and is part of Daffin Park. The dog park is fully-fenced with a large common area and a separate section for small dogs who don’t feel comfortable around large dogs. Additional features include shade trees, clean up stations, water fountains, and free parking. Mother Mathilda Beasley Park is located at 500 E Broad St, Savannah, GA. Bring your pet to run and play off-leash at this fenced dog park in downtown Savannah. Note that dogs are only allowed in the dog park area on the north end of the park. The park also includes a playground, paved track and sports fields. Daffin Park is located in Savannah off E Victory Dr, and it has a dog park as well as a playground, basketball courts, swimming pool and much more. Forsyth Park is located off Drayton & W Gaston Streets in Savannah and is a large park with multi-use facilities, lots of green space and a spray pool. Lake Mayer Park is located at 1850 E Montgomery Cross Rd, Savannah, GA, and it is a large park with a dog exercise space, picnic pavilions, access to the lake, sports courts and much more. It’s a great spot to bring the whole family, furry family members included, on a beautiful day. L Scott Stell Park is located at 383 Bush Rd in Savannah, and it includes a dog exercise area, picnic pavilions, lake access with fishing pier and boat ramp a playground and more! Barks is located in Savannah at 101 Little Neck Rd. At Barks they aim to provide a luxury canine boarding and full-service, daycare, equipped for indoor and outdoor play, social interaction and pampering. With supervised off-leash play as their focus, dogs happily expend energy while their owners are away at work or play. Their ultimate goal is to improve the bond between pet parents and their dogs by providing a worry-free outlet for supervised, off-leash play and exercise. Animal Resort & Spa in Savannah is located at 2357 Ogeechee Rd. They offer boarding and grooming services for dogs with climate controlled boarding enclosures. They also have an outdoor play area where your furry friend can have some group play time and meet new friends. Catnip-n-Biscuits is located in Savannah at 2615 Skidaway Rd and is a premier pet hotel and doggie day care in Savannah. Your pets will enjoy an enriching overnight and day care experience in their upscale facility. They offer many options for day care and overnight lodging for your cats and dogs, such as: luxury suites, private care rooms, traditional day care, VIP day care, private day care, geriatric day care, and activities to keep your pet engaged and active for the duration of their stay. Catnip-n-Biscuits is where staying and playing are your pets favorite treat! Club Fido & Friends is located at 107 Horizon Park Dr, Savannah GA and is a premier dog daycare, providing a fun, safe and upscale environment for dogs, or as they like to call them “Clubsters,” to interact and play. Club Fido’s kennel-free club concept provides the highest levels of fun, safety and service for their furry guests, and peace of mind for their pet parents. Critter Sit is located in Savannah at 101 Sunshine Rd, and it is owned and operated by a veterinary technician. Check out Critter Sit to gain piece of mind and relieve the guilt you feel “leaving your dog home alone all day”. With Critter Sit, your canine family member will play and exercise with other dogs in a loving and supervised setting, and you will have a happier more fit dog. They have climate controlled indoor and outdoor play areas, separate areas for small and large dogs, flexible drop-off and pick-up times and a different outside playground for every day of the week. Most cats prefer not to leave their own familiar home environment. If this is the case, and you need care for your cat while you are away, please check out our information on Savannah cat sitting and overnight pet care. If you want to have your cat stay somewhere while you are away, there are a couple of options in the Savannah, GA area. Some vets in the area also board cats. Catnip-n-Biscuits is located in Savannah at 2615 Skidaway Rd and is a premier pet hotel and day care in Savannah. Your cats will enjoy an enriching overnight and day care experience in their upscale facility. Their cat condos are in a private area of the facility, far away from all the dogs and doggie noises. Each cat will enjoy playing in their private cat play room equipped with special cat toys and scratching chair! They will never share their playtime with another kitty so they don’t have to worry about meeting the neighbors! Catnip-n-Biscuits is dedicated to providing only the highest quality kitty care! Your feline will be purring with happiness when they stay with them! Animal Resort & Spa in Savannah is located at 2357 Ogeechee Rd. They offer boarding for your feline friends (as well as other pets). The cats are boarded in a separate quiet space away from the dogs, and each cat gets their own condo with bed, toys, food, water bowl and litter box. They also have larger condos that can accommodate multiple cats from the same owner. Individual playtime is provided daily in a separate playroom for cats. Thank you for reading about our Pet Sitters and Dog Walkers in Savannah. We hope you also found our Must-Know Pet Places in Savannah helpful in learning more about the area. If you have any questions about our pet services in Savannah or would like to make a suggestion for an addition to our “must-know” list, please contact us today!